In our world, nothing comes close to the perfection that is caramel. That silky creamy “just leave me alone for a minute” kinda feeling you get when you nosh on a homemade caramel. The secret is in the simple technique and in using the correct ingredients. 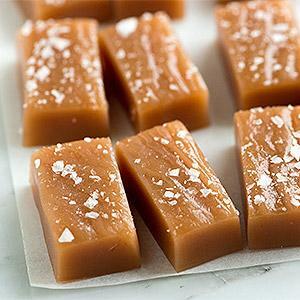 In this one-of-a-kind caramel-a-thon, pastry chef, Nora Kaschube, shares her expertise on the art of making the perfect caramel. We’ll learn (and sample decadent Caramel Chews and Fleur de Sel (Sea Salt) Dark Chocolate Salted Caramels. A perfect class to learn how to make these tasty treasures at home for gift-giving on special holidays, or just to enjoy all by yourself. Registration is limited for this class so students can receive significant one-on-one training with Chef. Sun 8/18/19 10:00 a.m.-1:00 p.m.